Home » Ornament » Art Nouveau Ornaments – Art deco Period 1910. Illustrations, Design Decoration with dandelions, Flower Tendrils, Blossoms, Floral, Flowers. Graphics by Alfons Mucha. Previous PostZangen Sieger Can opener. Next PostCastle Dürnstein Austria. Old Postcard 1928. Plants tendrils. 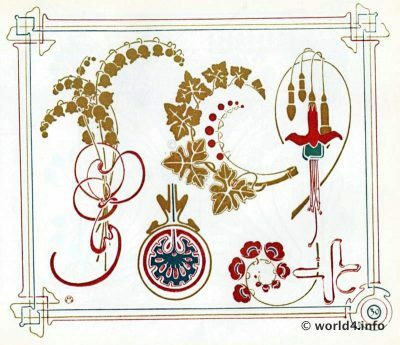 Art Nouveau Ornaments by Alfons Mucha.